Looks like hell has frozen over — there’s now an Ontario open buildings layer that’s compatible with the OSM licence: The Open Database of Buildings. Thanks go to StatCan for aggregating all the data sets into one huge database. A certain sarcastic file format will be pleased to know that it’s all packaged as one gigantic shapefile. How and where and when a Scottish guy whose family has lived near Glasgow forever found love far away and now moves slowly back & forward along Eglinton Avenue East. In a world of filter bubbles and fake news the importance of understanding how we know what we know and where our information/knowledge comes from is greater than ever. 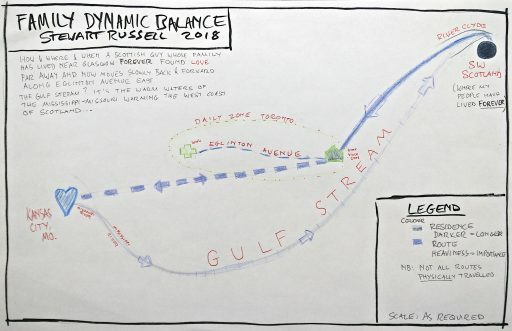 We can use mapping to help us understand these invisible structures that control parts of lives and reveal the ways our perceptions are shaped. 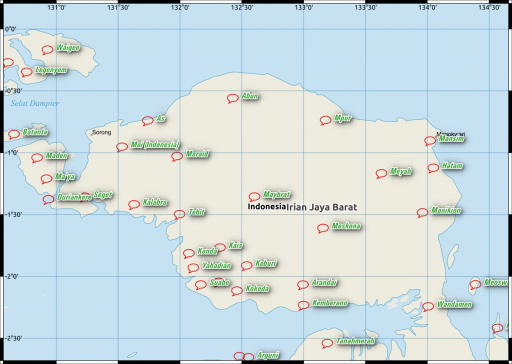 In this hands-on mapping workshop we will create maps of personal knowledge (e.g. 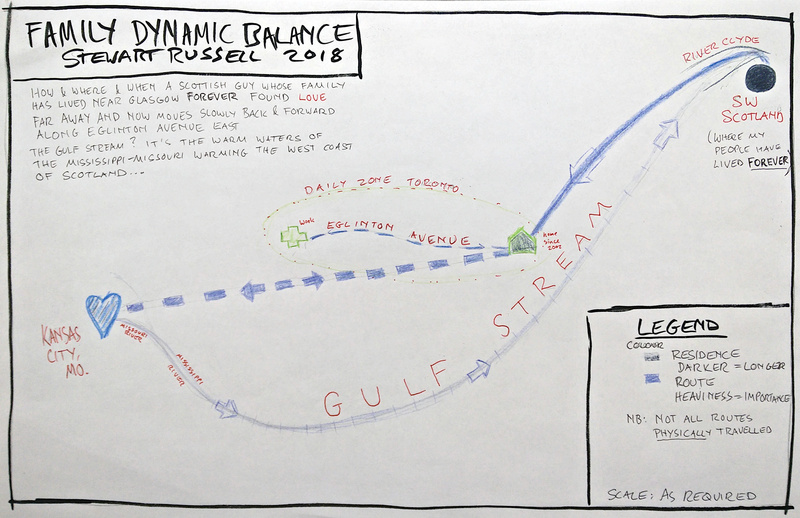 personal itineraries, common perceptions, fears, etc.). We will ask: how do I map my perception of the world (e.g. through news media or walking)? Participants will apprehend “their state of our knowledge of the world” on a particular subject as well as create representations which bridge the real and the imaginary. 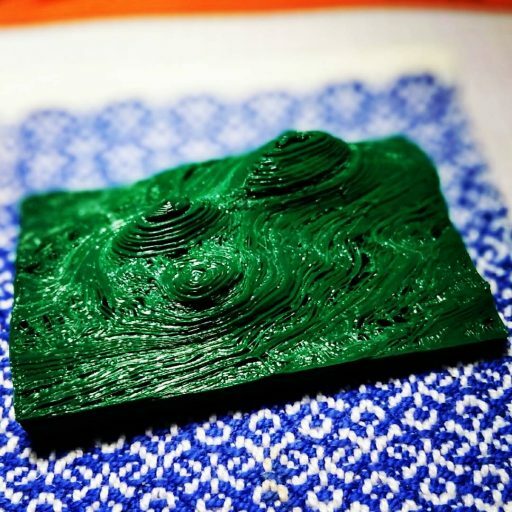 Experimental Cartography: Mapping Knowledge and Perceptions of Our Worlds was hosted by the public visualization lab at OCAD U in the evening of 2018-09-19. 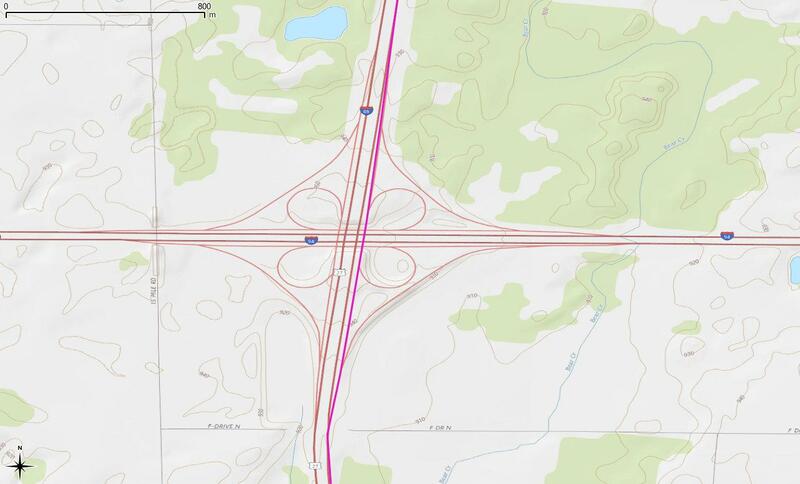 Well, that was fun … because the slip-road at the I 69/I 94 junction in central Michigan is a slightly shorter route than continuing on the I 69, The Algorithm (which cannot be Questioned) routed me off the I 69 then back on again. These self-driving cars, I dunno … least useful innovation ever. Took me nine minutes to legally cross Warden Avenue. I had to walk roughly 400 m to get to a crossing, then 400 m back down the street. 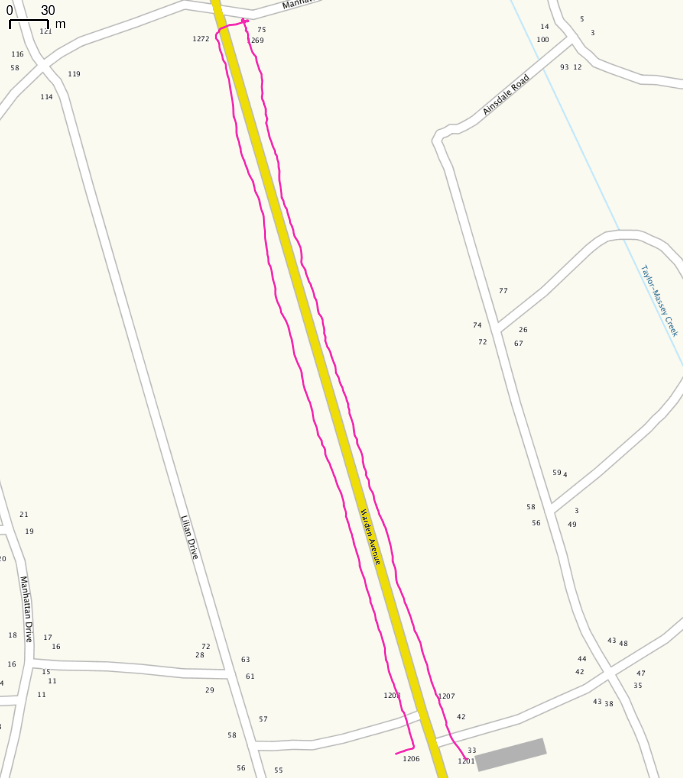 Straight-line distance between the bus stop and my destination is about 40 m.
Would drivers put up with this? 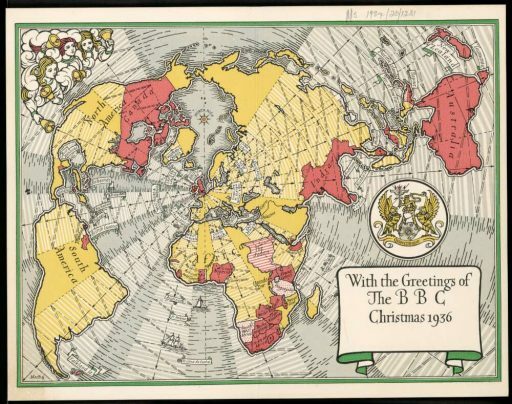 Source: National Library of Australia — “With the greetings of the BBC. 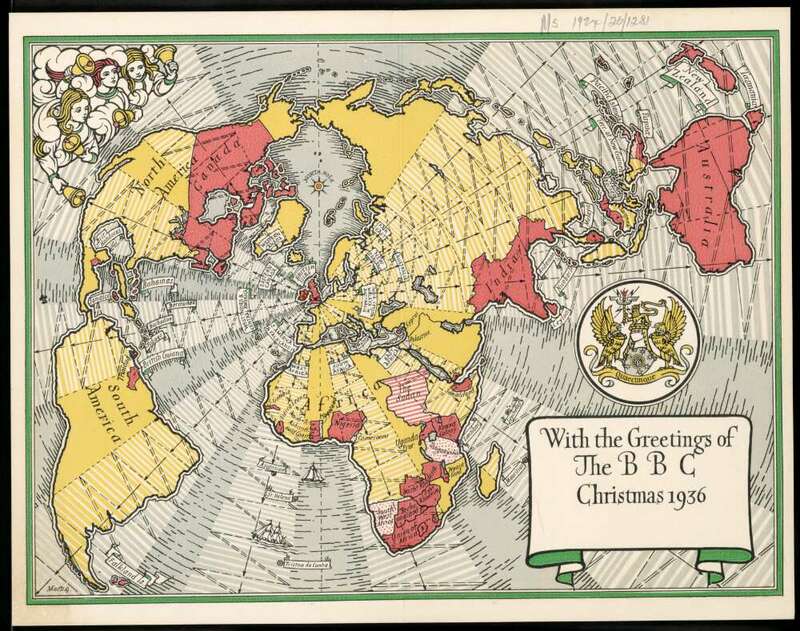 Christmas 1936” Promotional christmas card with schematic world map produced by the British Broadcasting Corporation. MapSCII – the whole world in your console! 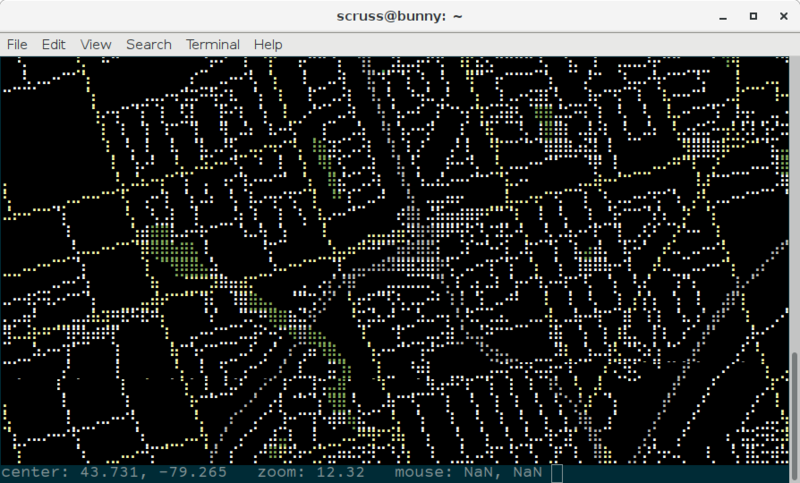 Just telnet mapscii.me, or watch the demo. Based on Selasi Dorkenoo and Claus Rinner’s presentation at Toronto #Maptime – 3D Printing Demo. More later. Map markers: font: Overpass (licence: SIL OFL/LGPL), character:  — U+1F4AC SPEECH BALLOON. You use OpenStreetMap as a base topographical map and make your best reasonable efforts to exclude ALL restaurants. 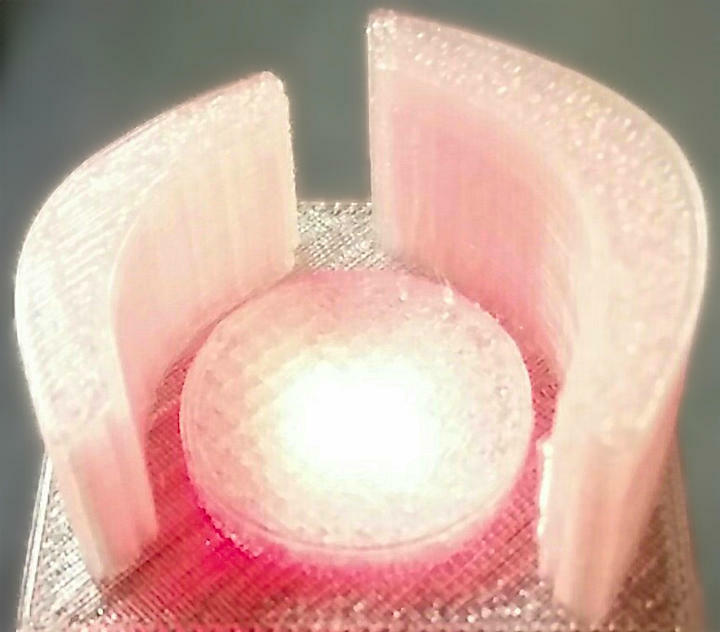 You then add a layer of your own restaurant data. You add restaurants in one area from non-OpenStreetMap data based on comparison with OpenStreetMap data in other layers. So for this article, please bear in mind that where the above example says restaurants, I’m looking for an analogous case with hotels. 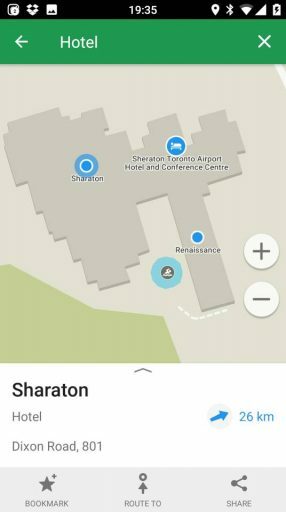 MAPS.ME (which they want you to pronounce as “maps with me”, even though it says “maps dot me”; I guess “maps ∘ me” wouldn’t make such a nice URI) is an offline map app that shows a mix of POIs over a custom-styled OSM basemap. Its publisher mixes OSM POIs with proprietary ones, and publishes a list (local copy: skipped_nodes-20160731.zip) of OSM nodes that it has skipped from its POI list. 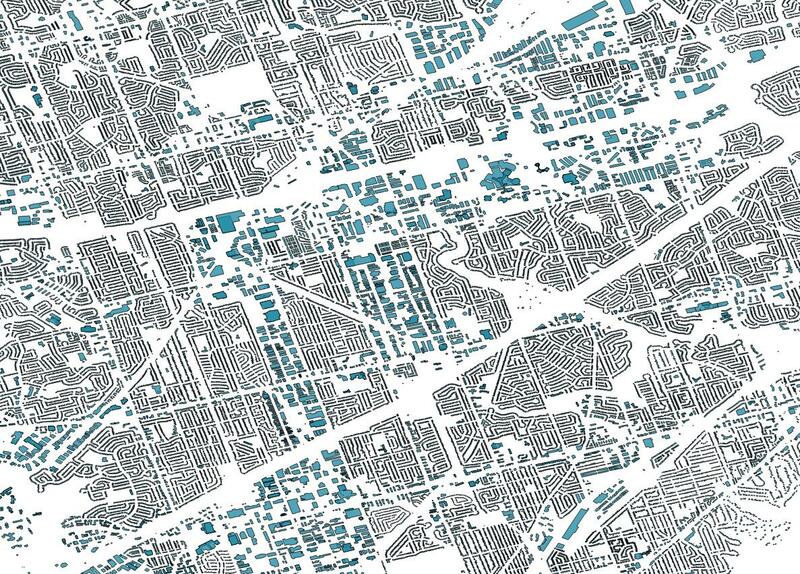 To satisfy my curiosity, I wanted to see if the required separation of data was in place with maps.me. 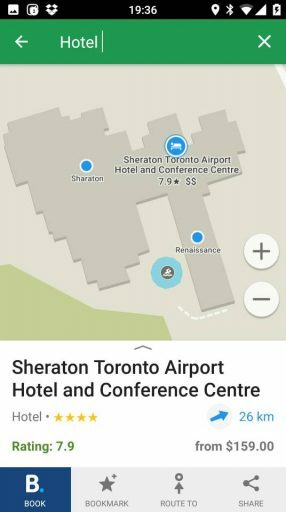 First, I used overpass turbo to return all the hotel and motel nodes in and around Toronto (the query I used was “type:node and (tourism=hotel or tourism=motel) in bbox”, saved as TorontoHotelNodes.zip). This list contains 50 hotels and motels. Next, I used maps.me’s skipped nodes list to find the OSM hotels and motels that maps.me had omitted from their app. This list should closely match the one from booking.com, where the app company said they got their hotel data. 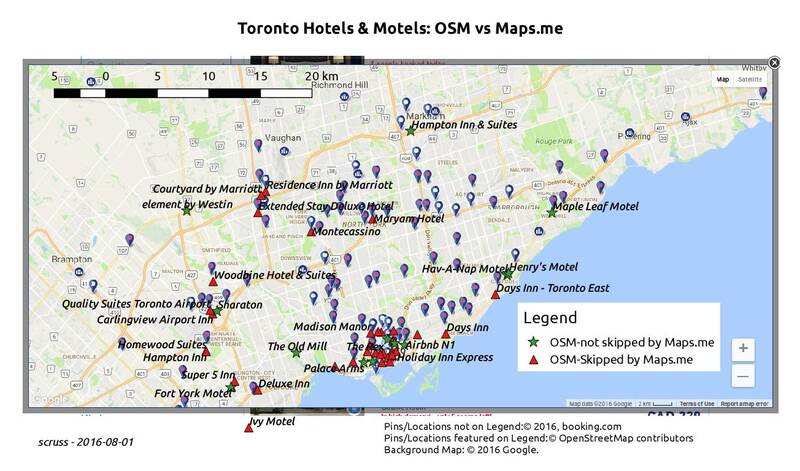 For completeness, I queried the OSM hotels extract to see what hotels maps.me had possibly not skipped. So OSM nodes not skipped (which is not necessarily the same as used) by maps.me are marked ★, while those excluded by maps.me are marked ⯅. At first glance, there’s clearly not a 100% correlation between booking.com hotels, but a few clues emerge that hint strongly that maps.me are mixing in some OSM nodes with some proprietary nodes. 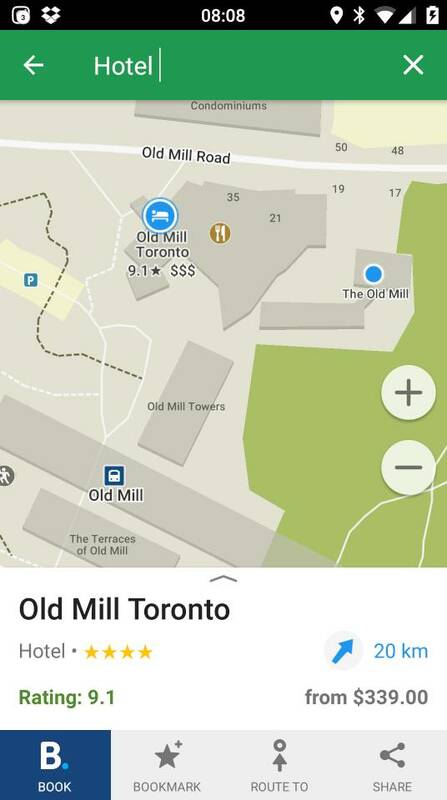 It’s therefore likely that maps.me has not abided by the OSMF community guideline. 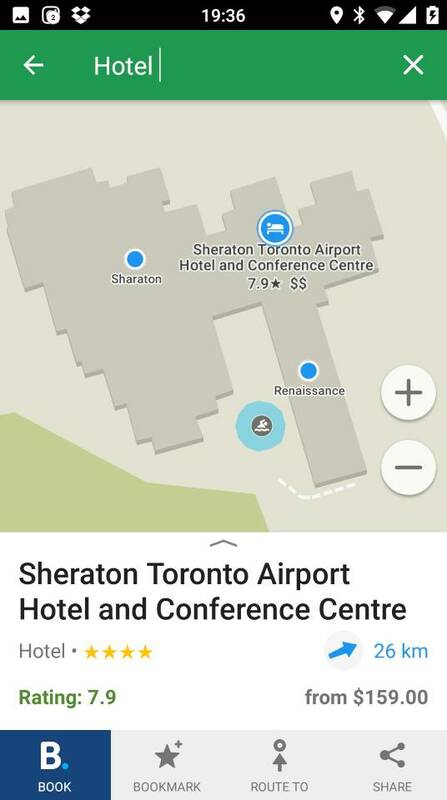 I wonder if maps.me will exclude the OSM node for this Sheraton from now on? Now that its name has been edited, if they do skip it, it means that they’re comparing OSM against a proprietary list, so would be breaking the guidelines. On the other hand, if they don’t exclude it, they really need to get a better fuzzy match algorithm, and post haste. In addition, I wonder if maps.me’s skipped nodes list could be considered a “derived work” of booking.com? As the choice of nodes to skip is informed by booking.com’s data, it does give us a small insight into their database. Turned off to make you aware of the Directive on Copyright in the Digital Single Market protests … wtf?